These two scenes are from two seminal American movies of the early 1950s, both starring Marlon Brando at the height of his powers: The Wild One and On the Waterfront. The Wild One was banned by the censor Gordon Mirams and condemned by most New Zealand's cultural guardians as violent, crude, immoral and a dangerous example to the nation's youth. For them it typified the features these protectors of morals, manners and 'high' cultural values deplored in Hollywood movies. For decades, this negative view of American movies had prevailed amongst New Zealand's powerful cultural guardians, whose ranks ranged from film censors, government ministers, and the educational and religious establishments to the cultural intelligentsia and public intellectuals. These critics came from both the right and left of the political spectrum. Tivoli Cinema, Christchurch, early 1950s. Before the arrival of television in the 1960s, central Christchurch had ten cinemas with others located int the suburbs. From the first world war to the early 1960s movie-going was a central feature of New Zealand's cultural and social scene. The small country had more cinemas per head than any other nation, and its attendance rates were in the same league as those of Britain and the USA. Even small rural towns showed movies on improvised screens in small halls while some big city cinemas were modelled after the latest cinema theatre architecture of the USA. These movie theatres and the films they showed were to be remembered with nostalgic affection by the audiences, especially children, who enthusiastically watched Walt Disney favorites, popular stars, such as the Marx Brothers, Charlie Chaplin, Norma Shearer, Douglas Fairbanks Jr, Errol Flynn, John Wayne and cartoon characters, including Bugs Bunny and Woody Woodpecker. 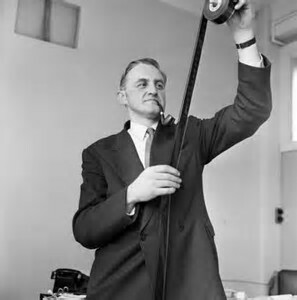 Truby King - highly respeted pioneer in infant and child health care, who maintained children and youth needed protection from the malign influence of cinema. Gordon Mirams, film censor, architect of New Zealand film societies, author of 'Speaking Candidly', the first book to examine the impact of movies on New Zealand culture and society. Despite, and probably because of their great popularity amongst New Zealanders during that era, Hollywood movies became the focus of concerns about the nation's emerging national identity. For decades American films were the bete noir of New Zealand's cultural guardians. Mandarins (both left and right) from the intellectual, political, educational and religious elites insisted that American movies threatened to overthrow the nation's "Britishness", corrupt its youth and corrode social and moral values. Hollywood was maligned as the subversive and malignant stalking horse of American capitalism, subtly preparing the way for an economic and cultural takeover of New Zealand. The campaigns against American movies were led not only by key figures with influential roles in education, government , and the churches. Public intellectuals. These cultural and moral guardians justified their attacks on American cinema by constructing a condescending and misleading stereotype of New Zealand movie audiences: gullible, passivel, childlike, needing guidance, protection and direction by their intellectual and/or social betters. Their attitudes towards Hollywood movies also reveal not only intellectual and social condescension, but also contain significant elements of racism and anti-semitism. AS early as 1918 Dr. Truby King, an internationally renowned expert on infant and child care, claimed movies and cinemas were sources of laziness, dissipation and immorality for young New Zealanders. The spread of American cultural icons such as Coca-Cola (exemplified by this Coke ad) was enhanced by the arrival of U.S. troops in New Zealand in 1942. The trend was repeated in Australia, Britain and France. Such appropriation of American culture was soon to be condemned as'Coca-Colonization.'. Above: American troops shopping in Wellington.Their high spending ways, smart uniforms and more sophisticated manners made them popular to women and unpopular with a lot of jealous New Zealand males. Right: U.S. troops marching down Manners Street, Wellington, 1942. Popular movies - especially American movies - became the target of controversy during the first half of the twentieth century in the face of attacks by many of New Zealand's cultural guardians and public intellectuals during the first half of the twentieth century. In 1942 the first contingent of several thousand American troops arrived in New Zealand in response to post-Pearl Harbor Japanese expansion in the south Pacific and south-east Asia. The ignominious collapse of the British military presence in Malaya and Singapore in the face of the Japanese onslaught meant that within a few months New Zealand had to abandon its traditional shortsighted reliance on Britain for protection and instead turn to the USA. The physical and strategic presence of American military power manifested the increasing influence of American cultural power from the beginning of the century, notably in the forms of movies, music (especially jazz) and comics and pulp fiction. For the overwhelmingly Anglophile and elitist majority in New Zealand's cultural establishment this was an intolerable situation. Accordingly, after 1945, advocates of 'high' culture along with those on the political left campaigned vigorously against the American cultural invasion, exemplified by its three principal vectors:Hollywood movies, popular music and comics / pulp fiction.The attack on Hollywood was led by the film censor and public intellectual Gordon Mirams and the influential educator W.J. Scott. Their campaign was assisted by several of New Zealand's intelligentsia, such as the poet A.R.D. Fairburn and Elsie Locke, author, shrewd polemicist and probably New Zealand's best known Communist at the time. Joe 'King' Oliver and his jazz band. Jazz was condemned as 'jungle music', 'N..... music' by many of New Zealand's cultural guardians. For them it was the antithesis of 'proper' music and'high' culture. After 1945 American comics and pulp fiction were targeted by the left in campaigns that followed the templates of similar assaults by the French and British Communist parties. 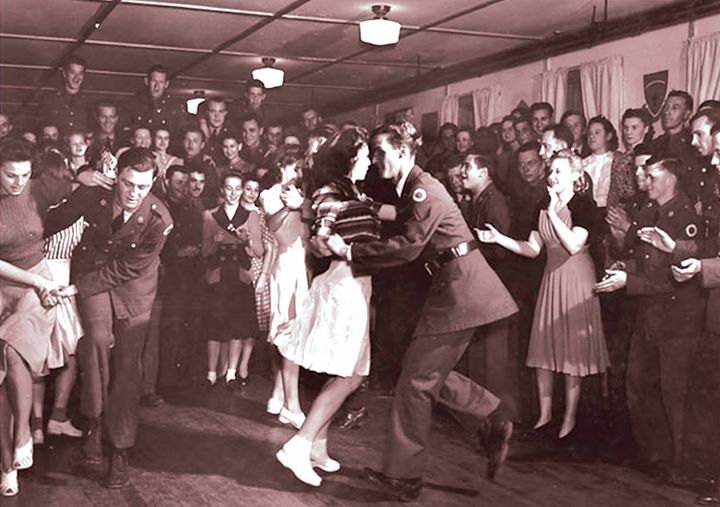 Swing dancing and, jitterbugging were introduced by American military in New Zealand as in Britain and Australia.Once again, both were condemned as crass and vulgar forms of American entertainment that threatened the morals of the young. The post-1945 decade saw several key voices amongst the younger generation of New Zealand's cultural personalities and intellectuals as well as some public figures, rise to defend movies in general and Hollywood cinema in particular. Mirams in particular came under increasing criticism for letting his political views, especially his anti-Americanism, influence his judgements. Most of these fresh voices did not share the left-wing ideologies of people like Mirams and Locke. They did not follow the Communist party line linking American cultural influence with American political imperialism. They also rejected the anti-semitism that was was a key part of attacks on American popular culture, esoecially movies and music.Nor did they share the previously dominant cultural Anglophilia and glorification of 'high'culture. J.G.A. Pocock: now regarded by some as "the English-speaking world's greatest historian still alive", Pocock taught at Canterbury University in the 1950s. He took a keen interest in movies, admiring the work of some Hollywood directors like John Ford, and Hollywood's use of film noir to probe the human condition. The new generation of New Zealanders writing about movies followed t Andre Bazin and the Cahiers du Cinema crtics in praising the craft and insight of some Hollywood movie makers. Hollywood genres such as westerns and musicals (especially those of John Ford) gained new respectability, as did the emerging film noir genre. New Zealand movie commentators such as Pocock and and another academic, J.C. Reid, admired their vitality.